This week Ann-Christine hosts Unexpected for Lens Artists Photo Challenge, “My post hopefully will contain something you would not expect from me!” It was unexpected and such a fun post. On a sunny morning, our tour bus stopped at a very low-key, but picturesque village in Peru, we looked around and didn’t know what to expect. 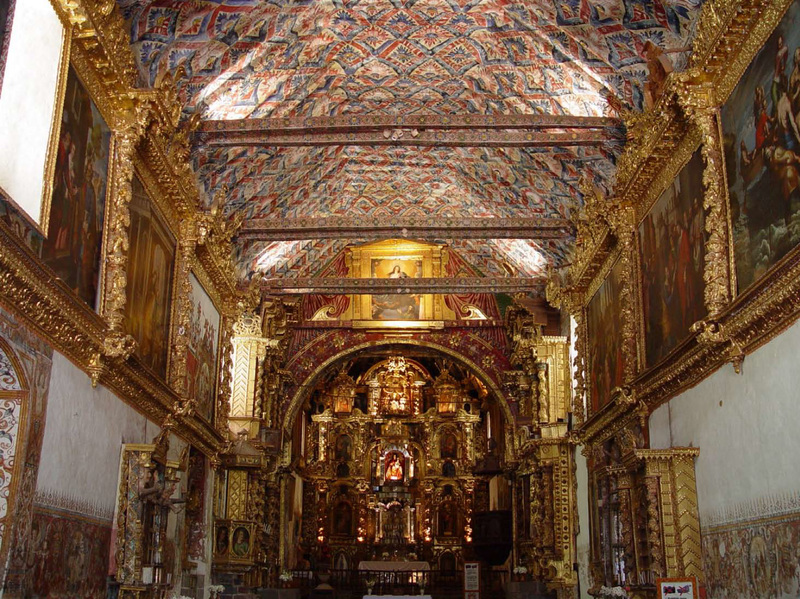 Inside was an eye-popping kaleidoscope–a dazzling display of colorful murals, a painted ceiling and an ornate gold-leaf altar. So very unexpected. No photos were allowed inside. These two photos below are from Google Images. Now we are at the Abra la Raya. It is a high mountain pass at an elevation of 4.350m (14,271ft) above the sea level. The scenic drive was unexpected. A few days ago, I took look through the WP traffic analysis and saw some interesting and unexpected results. Among 30 Lens-Artists Photo Challenge posts and other posts so far, The “My Travels” post is listed as the most popular post based on the numbers of views. As you may have noticed, my blog topics incline to the beauty of nature and my travels. So it’s a surprise to see my two book reviews are ranked next to my popular Lens-Artists posts according to WP’s report; one is And the Mountains Echoed and the other Beneath a Scarlet Sky. The story began in Dolomite (Italy Alps) when Pino was only 18 years old. “Did something totally unexpected happen today? Did you meet someone unexpected at the grocery store, or did you find something in an unexpected place …or, maybe You are up to something unexpected?” Join us and share your photos and stories. Thanks to Ann-Christine for hosting this fun theme. Remember to make a link to Ann-Christine’s post and tag your post. Create a link to this post. Wow, theat church looks to be quite a sight, Amy! It’s always a treat to see your beautiful captures! That church was described perfectly by you… a Kaleidoscope of colors! Spectacular! Thank you, Nancy! After the visit, we all wondered why they built the chapel in a place that is so isolated. I see and feel miracles in your post, Amy. That is unexpected as I read the narratives and allow your shots take over my sensation, Sigh … you are good. Thanks for the images of Peru, they convey your sentiments, well done. Wonderful Peru! What a spectacular and unexpected interior of that church – no photos allowed. That is in fact rather good, even if we maybe don’t like it. It is an advantage for taking in the beauty when you are there. The scenic drive look really spectacular too – love the great mountain sceneries. It was good, I agree. I felt free to wander around to appreciate the details in the chapel. The scenic drive was great, but I was half awake and fought to get focus to take some photos due to the high altitudes. Well, more than half of 19 travelers were asleep on the bus. Thank you, Tina! I hope to bring more traffic to L-A. I love your stunning blood moon shot!! love the blue from Peru- and the wares for sale in that mountain shot at Abra la Raya was so striking to see the human items next to the vast terrain. The quotes were enjoyable too – I could especially relate to the first one “only after you have lived…” because this is why i do not wish to go back to a certain time or place – I know that I needed to “live” and learn things and we make decisions in real time with who we are then. Helps with contentment. Hi Y! So good to see you! Well the spot of Abra la Raya ws the last stop they could sell stuff to tourists. Thank you for taking time to read the reviews. I, too, love the quote “… only after you have lived…” Your comment made me think a little more. Wonderful photos. Great choices for the theme. Perfect seems a fascinating country and the chapel just amazing. Your photos are amazing Amy. It makes me remember the book and the film adaptation of ALIVE, a true story on the Andes survivors written by Piers Paul Read. I enjoyed reading that although it was a grim account of the survivors. Hope you’ll find a copy Amy. Wonderful and peaceful pictures Amy!!! Glad you enjoyed the scenery! Thank you for commenting, Gavn! Beautiful post–both the images and words! I love the quote from Beneath a Scarlet Sky. I’ll have to take a look at it on Amazon. Your description and images of Peru have now intrigued me so much that I’ve moved it up on my “To Go” list! Stunning. Thank you, Patti! Beneath a Scarlet Sky is a good read. A true story. I couldn’t stop reading the book as soon as I started. So much to see in Peru, but getting there was something else. We had to wait 5 hrs at the Miami airport, then the flight delayed 2 hrs. When it took off it was 2 am. We were so exhausted. Then the plane had to stop at the Bogota, Columbia, bcause Peru does not have an international airport. So no rest that night. But, it all worked out. I don’t mean to discouraged. I wish we knew a little more before we went… and we still would go. Yes! That sound like a travel nightmare!! Wow that’s beautiful…The Saint Peter the Apostle Church is magnificient. Wonderful place. I like the mountains. Beautiful captures and I can not get over the intricacies of the architecture of the church…incredible! Two photos of the church were located in Google Image collection, Glad you enjoyed it. We were all so surprised as we stepped into the church. I can only imagine what it looked like in person!! Your tour in Washington Peru fantastic, your photos as well. Oh no. No books written by me! You’re right, it’s not a prosperous country. It seems there are so many people depend on tourists to make money. I thought you wrote you had written some books. My mistake, Amy. Oh how I enjoyed your photos, Amy, especially the trip to Peru. Loved the church and the glorious Andes in the background.